Politics. Religious debates. Drama. Drama. Drama. That's about how my social media newfeeds look lately. Everyone seems to have an opinion and no one want to believe that its okay to have an opinion that's different than their own. It's all a bit too much, and I am certain I can not be the only one who wants a break from all the negativity. We need something positive. Something fun. We need some humor! He’s a comedian. He’s a YouTube sensation. And now he becomes an author. Best known for his song parodies and riffs on yoga pants and homeschooling, Tim Hawkins now shares his perspective on life in the 21st century in his long-awaited debut book, Diary of a Jackwagon. Do you feel overwhelmed by current events? Has modern life got you down in the dumps? What you need is a good old-fashioned laugh! Whether he's writing about donuts, denominations, yoga pants, or fire ants, popular Christian comedian Hawkins is guaranteed to deliver just that---and plenty of it. Foreword by Bubba Watson. Who says Christians cannot be funny or laugh at themselves? Whoever it was had never given Tim Hawkins the chance! He is a Christian, he is a comedian and he is HILARIOUS! Now, I have to be honest...I'm not usually a fan of comedians. It's not that I don't love a good laugh, I do! It's just that...have you heard the mainstream comedians these days? The language! The innuendo! No, thank you! Or what about the insults? Is it really necessary to put others down to get a laugh? That's just not my cup of tea. Whatever happened to good clean fun? In Diary of a Jackwagon, that's just what you'll find! Tim shares his thoughts on a variety of topics like fatherhood, marriage, Christianity and life in general in a way that kept me laughing a coming back for more! Christians have a bit of a stereotype around us that suggests that we all take ourselves way too seriously are are quite frankly, sticks in the mud. Tim Hawkins provides a great example that that's not true at all. We can laugh at ourselves, we can tell a good joke and we can enjoy a little humor without going against our beliefs. The person who needs a good night's sleep (or the person married to them). Trust me when I say, this isn't proper bedtime reading. Not only will you find yourself not wanting to put the book down, but you'll also find yourself laughing out loud... keeping everyone awake! The person who REALLY needs to pee. Clear your bladder before picking this one up. Laughter is inevitable. The person who HATES to laugh. But really, does that person even exist? 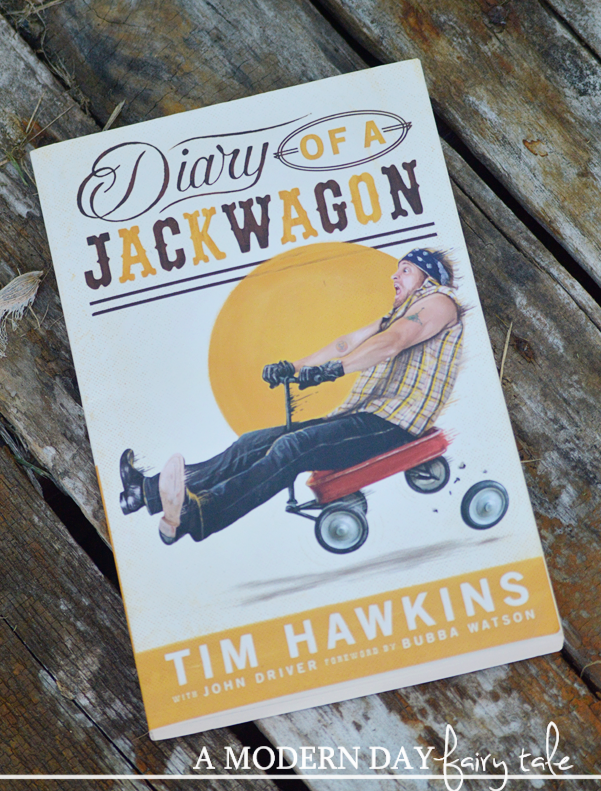 For everyone else... whether you are already a Tim Hawkins fan or have never heard of him in your life, if you're looking for a break in the seriousness that life sends our way, Diary of a Jackwagon is worth checking out! Diary of a Jackwagon is available now at Family Christian. OMgosh I just love everything there!! They have pillows and pillow wraps there recently and they've become my new obsession!! They are too cute! Nice website. I think the Joni and Ken: Untold Story coming out in Oct. My husband is a quadriplegia so that book is a must read for me. I also love their jewelry. They have so many cute things!